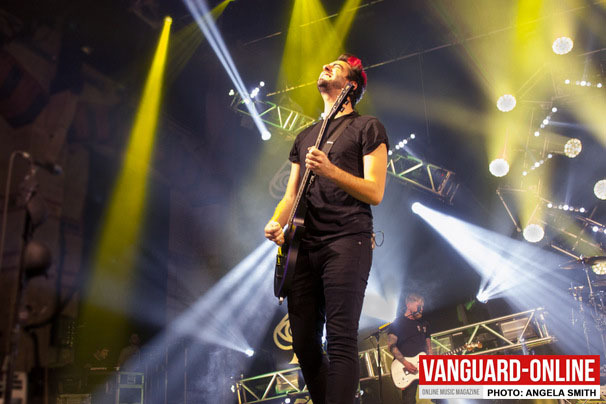 Baltimore’s worldwide sensation ‘All Time Low’ are four stops into the 17 date UK’ The Young Renegades’ tour. 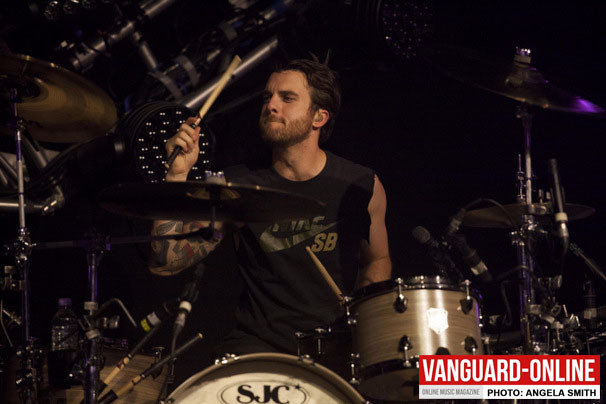 Bursting onto the scene in 2003, All Time Low have released six studio albums, sold over 1.3 million albums worldwide, have 100+ million views on YouTube, toured with the biggest bands such as Blink 182, Green Day, Fall Out Boy and Foo Fighters. They’ve played major festivals around the world, including Reading/Leeds in the UK, Soundwave in Australia, Summersonic in Japan, and the legendary Vans Warped Tour in the U.S. Now they are here, in the quiet cycle city of Cambridge.The Cambridge Corn Exchange, packed full of sweaty teenage girls, a handful of mid-twenties men and a few parents stood at the back (keeping a close eye on the over enthusiastic teenage daughters). But even these guys were moving with the music- a good sign that the music isn’t that bad after all. Although after a few songs, I couldn’t tell if I was listening to the first song again, it all became a little ‘samey’ until Something’s Gotta Give from the Album ‘Future Hearts’, which was released in April 2015. The track saw one of the best receptions of the night, especially when giant beach balls were thrown into the crowd! 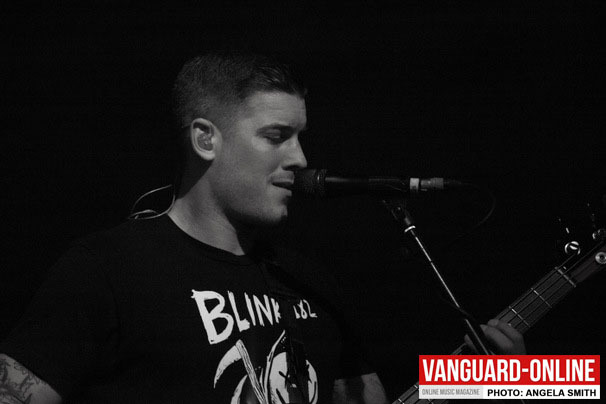 Somethings Gotta Give was followed swiftly by Kids in the Dark another high energy, pop-punk hit from the band. 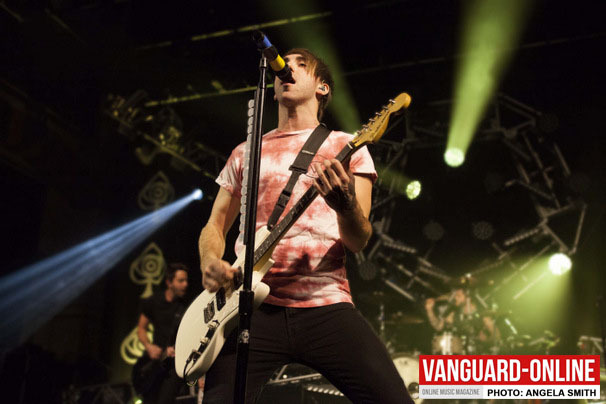 Lead singer and Guitarist Alex Gaskarth spent a lot of time interacting with the fans, with mic stands set at the very edge of the stage as close as they can be to the screaming red faces in the front row. Two platforms were well used by the front men to break out some impressive ‘rock star’ moves. “Thank’s everyone for coming, it’s been the best Tuesday EVER!” Alex, then addressing those in the raised seating areas, “You’re so far away, I miss you up there” sends another wave of screams from the teens up above. 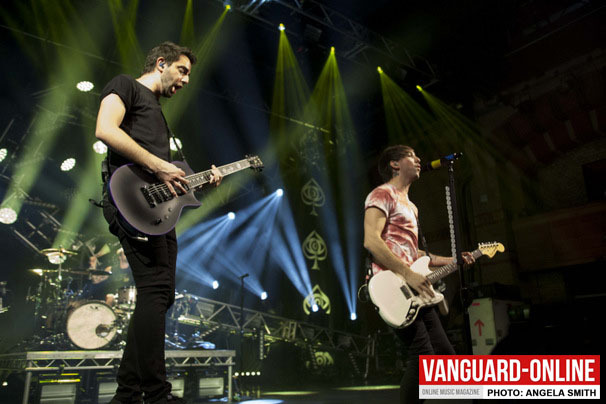 All Time Low played the newly released single Dirty Laundry from the new album The Last Renegade – out on June 2nd. A slightly slower more melodic pop track than the full-on pop- punk that All Time Low are known for- it’s still just as mesmerising. While there’s normally a few super fans at the front of any gig, who know all the words to all of the songs, I was surprised to see that almost all of the audience already knew the words to the newly released single and sang it at the top o f their voices. After a quick instrument change for most of the band including two broken snares for drummer Rian, It seemed only fitting that Jack would burst into Break stuff by Limp Bizkit -which, was quite impressive. As all went dark on stage at the end of Guts, the music stopped and a silence fell over the room. A single light raised to reveal a silhouette of Alex, alone on the stage to sing Therapy. A slow yet compelling single about anxiety, depression and coping. The lyrics relate to the bands own personal demons. For Alex the song represents the turmoil he endured when his young brother died after a battle with alcohol. 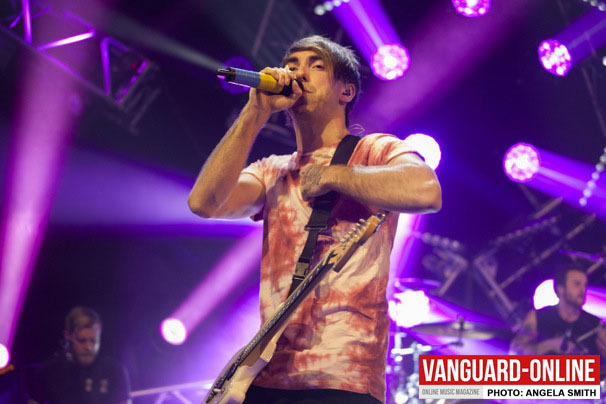 Along with another rock-ballad Missing You, the lyrics once again resonate with the audience, who sing every word along with Gaskarth. Amidst the fun loving, young at heart foursome, you can see that underneath the stage persona’s of the band, that the songs reflect the kind of tough times we all face in life, while giving a boost of hope and motivation for those that need it. It seems a time-honoured tradition to have bras and knickers thrown to the stage and tonight was certainly no different. Hanging from Jack’s mic stand, a Bra selection Ann Summers would be jealous of. As each song went on, more Bras were added. 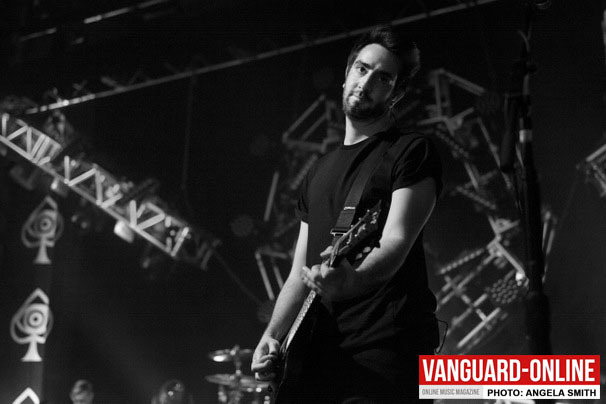 Jack at one point put on a pair of thongs thrown at him over his trousers as he played. These 30 something men certainly don’t look or act their age. Bouncing round the stage with more energy than a Duracell bunny on speed, mouths like sailors and a streak of naughtiness like over sexed teenage boys. With the most impressive light show I’ve seen, it seemed to amplify the energy that was emitted from the band that have now been knocking about for 14 years. It was almost worth going along just to watch the light show- that guy needs a raise! The never wavering energy kept flowing through the last two songs, Backseat and Take Cover , where a few people at the back decided to dive out to beat the crowds, missing out on the best songs, saved until last. At the end of the set after the lights went down and the band exited stage left, the obligatory chanting of ‘All Time Low, All Time Low’ carried on until they made their way back to the stage for the Encore. Kicking out Lost in Stereo the hit single off of their album So Wrong, It’s Right, Dear Maria, Count Me In. 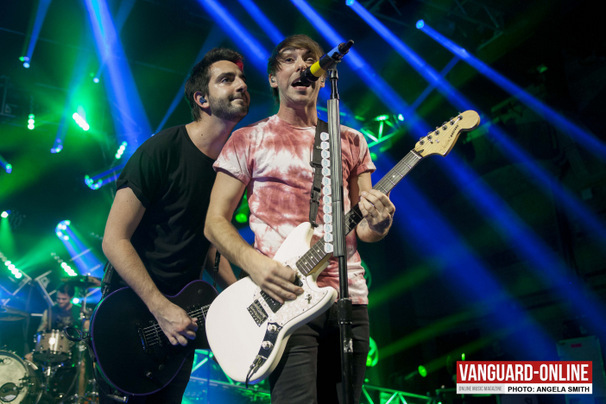 While Jack and Alex jump on the barriers, the room was filled by two giant confetti cannons covering fans in red and white tape. Those who waited long enough at the end were treated to just about anything that wasn’t taped down on the stage. Set lists, guitar picks, drum sticks, towels were all given out to adoring, ever faithful fans.